sufficiently high in the sky and the CHIRP pinging away we begin our first survey line toward a seamount some 8 nautical miles from what we think is the shallowest point of the reef. calculate the size and position of the subsea feature necessary to produce it. These satellite-derived seafloor topography maps are what we use to plan our mapping mission today. So how did our 948m measurement compare? Turns out the satellite map was showing 851 meter depth, so it seems to have been off by about 100 meters or a little more than 10% - pretty good accuracy for the deep ocean! First light of morning shows Seamans at anchor in the middle of the Pacific. 11:10 We’re now creeping toward one of the two peaks that according to the satellite map might reach the surface. At depth of 700 meters, we stop and deploy the CTD rosette water sampler and tow the neuston net. This is at the same depth where we’ve conducted our other island stations, so I hope this an equivalent and comparable location. Interesting to think that if this reef was an island, it would be only mile or so distant while now we only see the unbroken horizon. The instruments on the rosette pick up clear signs of the interaction of ocean currents and the seafloor - the phytoplankton peaks both at depth and at the surface. 14:00 The station came and went, and we’ve been approaching what we thought would be the peak of this coral reef-capped undersea mountain. The CHIRP shows 450 meters and the bottom starts sharply falling away from us. 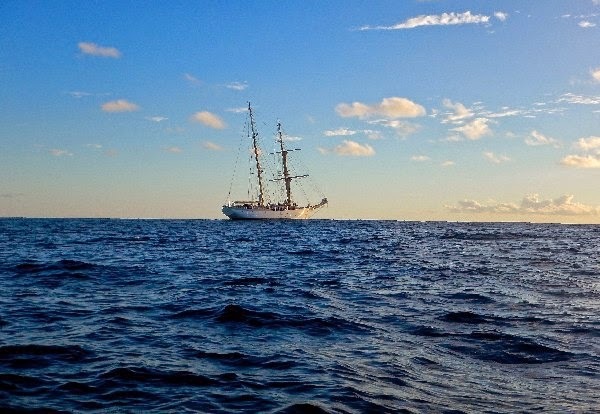 Nowhere around is there breaking water or changes in the color of the sea, both telltales of shallow water—we have a lookout up the mast to watch for these signs. Oh well, when you explore I guess you never know what you’ll not find… No matter, there is another pinnacle to the west of us, and we change our course that way. 1851 by one Captain Winslow of the whaling ship Phoenix. The current British Admiralty Pilot relates that at the time the reef was reported to be “extending 1 mile in a NW/SE direction, 71/2 cables wide, with two pointed rocks awash”. The next report dates to 1944 and mentions a minimum depth of 11 meters but no rocks awash. So we creep cautiously forward with the CHIRP pinging and I’m about to head up the foremast to act as an aloft lookout. Reef! Tomorrow morning we’ll go explore a little, and expect to have the first pictures of this reef that, as far as we know, has never been visited by anyone before us! from the bottom of the boat, kisses it and throws it back into the dark sea. Looking away from the light I see the reflection of the Milky Way off the water on the dark side of the boat, reminding me to look up at the brilliant night sky. We are so very lucky to be here tonight, lucky to have this gentle, settled weather. Lucky for this unique, unforgettable anchorage in the middle of the Pacific Ocean with nothing but the horizon in sight! Motorsailing under main, staysails and the jib.